In the immediate aftermath of the Word Bearers' attack on Calth, survivors from both sides were driven into the subterranean arcology shelters by the tortured Veridian star. 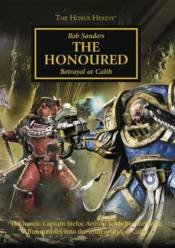 While their primarch Roboute Guilliman had planned for many seemingly unthinkable eventualities, the Ultramarines now face a new war in the underworld - could Steloc Aethon, renowned captain of 'the Honoured' 19th Company, be the one to lead them to ultimate victory over the traitors? Perhaps, if he can master his own bitter desire for vengeance!